The All Progressives Congress (APC) on Sunday felicitated with Muslim Faithful over the Eid el-Kabir season and urged all Nigerians to embrace the “Change-Begins-with-Me” campaign. This is contained in a statement signed by the APC National Chairman, John Odigie-Oyegun. 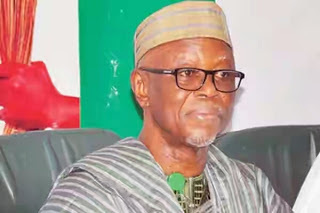 Mr. Odigie-Oyegun urged Muslims and all Nigerians to use the Sallah occasion to show love, promote harmonious and peaceful co-existence with one another, irrespective of ethnic or religious affiliation. He urged Nigerians to pray for the peace and quick recovery of the nation’s economy. “Muslim Faithful and indeed all Nigerians are enjoined to use the occasion of Eid el-Kabir to pray for the peace, development and prosperity of the country,” he said. He called on Nigerians to support the administration to pull the country out of the present hardship and restore the country on the path of growth in all facets. “Indeed, Nigeria is today passing through challenging times in its socio-economic life. “Happily, the President Muhammadu Buhari-led APC administration is already employing all legitimate and innovative means to restore the country’s battered economy to health in the quickest possible time. “In a bold move to repair our value system that has been badly eroded over the years, on Sept. 8, President Muhammadu Buhari launched the laudable national re-orientation campaign, “Change Begins with Me’’. “The party appeals to all Nigerians to be part of this campaign which will institutionalise the best practice and time-honoured values of honesty, hard work, patriotism, abhorrence of corruption, accountability and integrity in our everyday life,” he said.